Ready to make your own non-toxic natural cleaning products that are good for your family and the environment? Here are four recipes for success. Clean Your Oven: Sprinkle baking soda on the oven floor and spray with water until damp. Let sit overnight, and scrub in the morning. Remove Hard Water Buildup from Teapot: Add four ounces of white vinegar to a pot of water. Boil, then rinse well. Freshen the Air: Add half a cup of borax to the bottom of the garbage can or diaper pail to reduce mold and bacteria that causes odors. Keep Your Pipes Clean: Use plastic hair catchers to keep the biggest drain clog cause from mucking up the works. If you encounter a clog, try a snake or a plunger first. Or sprinkle a half cup of baking soda down the drain, followed by a half cup of white vinegar. 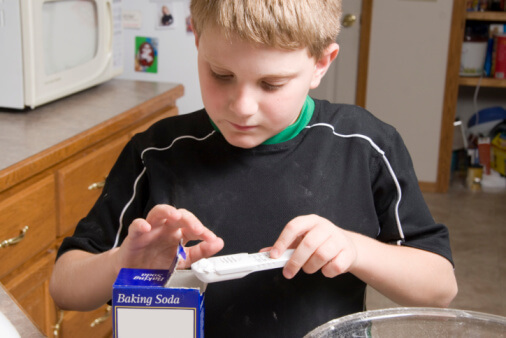 Clean the Kitchen and Bathroom: Try baking soda as a tub and tile cleaner. Use borax and lemon juice for the toilet bowl. On porcelain and glass, lemon juice brings out a shine, and baking soda or dry table salt make great scouring powders. Green Your Laundry: Stop using chlorine bleach and dryer sheets. They’re full of chemicals that are bad for you and the environment. More on your green laundry.